Apple on Tuesday delivered on a promise to give more details on the diversity of its workforce, revealing that its U.S.-based employees are overwhelmingly male and white— a breakdown that Chief Executive Tim Cook said must be improved. 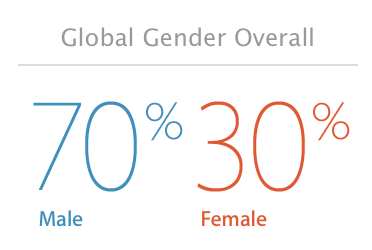 With 98,000 total employees, 70 percent of Apple's global workforce is male, the company's new report reveals. And in the U.S., 55 percent of its workers are white, followed by 15 percent Asian, 11 percent Hispanic, and 7 percent black. A breakdown of race among international employees was not given. "Let me say up front: As CEO, I'm not satisfied with the numbers on this page," Cook wrote in a note that accompanied the report. "They're not new to us and we've been working hard for quite some time to improve them. We are making progress, and we're committed to being as innovative in advancing diversity as we are in developing our products." Among non-tech employees, 56 percent in the U.S. are white and 14 percent are Hispanic, followed by 9 percent Asian and 9 percent black. Tech-specific American employees are 54 percent white, 23 percent Asian, 7 percent Hispanic, and 6 percent black. 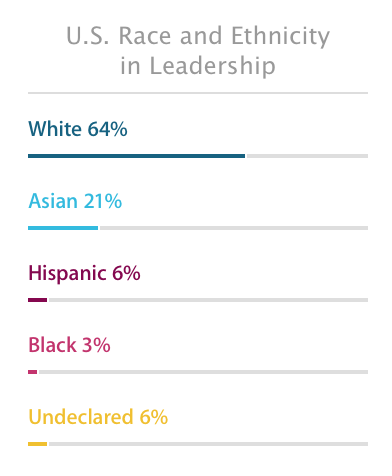 Among leadership in the U.S., the disparity is even greater, as 64 percent of Apple's top brass in America are white. Another 21 percent are Asian, 6 percent are Hispanic, and 3 percent are black. "All around the world, our team at Apple is united in the belief that being different makes us better," Cook wrote. "We know that each generation has a responsibility to build upon the gains of the past, expanding the rights and freedoms we enjoy to the many who are still striving for justice." Cook first promised last month that his company would release data on corporate diversity, but cautioned that he is "more focused on actions" than simply revealing information. Previously, the company had caught flack from human rights groups for the lack of diversity among its senior leadership. Apple has responded to the criticism by publicly committing to increase diversity, including a tweak to the company's corporate charter that commits the board to "actively [seek] out highly qualified women and individuals from minority groups to include in the pool from which board nominees are chosen." The company also added Susan Wagner to its board of directors in July, replacing longtime member Bill Campbell and bringing another woman into the fold. A Message from Tim Cook. At Apple, our 98,000 employees share a passion for products that change people's lives, and from the very earliest days we have known that diversity is critical to our success. We believe deeply that inclusion inspires innovation. Our definition of diversity goes far beyond the traditional categories of race, gender, and ethnicity. It includes personal qualities that usually go unmeasured, like sexual orientation, veteran status, and disabilities. Who we are, where we come from, and what we've experienced influence the way we perceive issues and solve problems. We believe in celebrating that diversity and investing in it. Apple is committed to transparency, which is why we are publishing statistics about the race and gender makeup of our company. Let me say up front: As CEO, I'm not satisfied with the numbers on this page. They're not new to us, and we've been working hard for quite some time to improve them. We are making progress, and we're committed to being as innovative in advancing diversity as we are in developing our products. Inclusion and diversity have been a focus for me throughout my time at Apple, and they're among my top priorities as CEO. I'm proud to work alongside the many senior executives we've hired and promoted in the past few years, including Eddy Cue and Angela Ahrendts, Lisa Jackson and Denise Young-Smith. The talented leaders on my staff come from around the world, and they each bring a unique point of view based on their experience and heritage. And our board of directors is stronger than ever with the addition of Sue Wagner, who was elected in July. I receive emails from customers around the world, and a name that comes up often is Kim Paulk. She's a Specialist at the Apple Store on West 14th Street in Manhattan. Kim has a medical condition that has impaired her vision and hearing since she was a child. Our customers rave about Kim's service, and they say she embodies the best characteristics of Apple. Her guide dog, Gemma, is affectionately known around the store as the "seeing iDog." When we think of diversity, we think of individuals like Kim. She inspires her coworkers and her customers as well. We also think of Walter Freeman, who leads a procurement team here in Cupertino and was recently recognized by the National Minority Supplier Development Council. Last year, Walter's team provided over $3 billion in business opportunities with Apple to more than 7,000 small businesses in the western United States. Both Walter and Kim exemplify what we value in diversity. Not only do they enrich the experience of their coworkers and make our business stronger, but they extend the benefits of Apple's diversity to our customers, into our supply chain and the broader economy. And there are many more people at Apple doing the same. Above all, when we think of the diversity of our team, we think of the values and ideas they bring with them as individuals. Ideas drive the innovation that makes Apple unique, and they deliver the level of excellence our customers have come to expect. Beyond the work we do creating innovative tools for our customers, improving education is one of the best ways in which Apple can have a meaningful impact on society. We recently pledged $100 million to President Obama's ConnectED initiative to bring cutting-edge technologies to economically disadvantaged schools. Eighty percent of the student population in the schools we will equip and support are from groups currently underrepresented in our industry. Apple is also a sponsor of the Human Rights Campaign, the country's largest LGBT rights organization, as well as the National Center for Women & Information Technology, which is encouraging young women to get involved in technology and the sciences. The work we do with these groups is meaningful and inspiring. We know we can do more, and we will. This summer marks the anniversary of the U.S. Civil Rights Act of 1964 —an opportunity to reflect on the progress of the past half-century and acknowledge the work that remains to be done. When he introduced the bill in June 1963, President Kennedy urged Congress to pass it "for the one plain, proud and priceless quality that unites us all as Americans: a sense of justice." 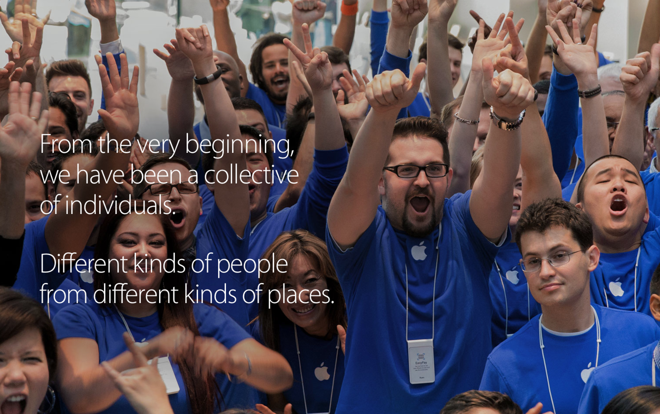 All around the world, our team at Apple is united in the belief that being different makes us better. We know that each generation has a responsibility to build upon the gains of the past, expanding the rights and freedoms we enjoy to the many who are still striving for justice. Together, we are committed to diversity within our company and the advancement of equality and human rights everywhere.